The Soviet zone did not participate in the currency reform that took place in the Western occupation zones in June 1948. When the new Deutsche Mark was introduced, all of a sudden, the old Reichsmarks circulating in East Germany became valueless. This situation forced the Soviets to quickly enact their own currency reform in the territories under their control. This situation would begin a period of political tensions between the Eastern and Western military governments that would eventually result in the creation of two separate German nations and the onset of the "Cold War". As was the case with the Western occupation zones, under the reforms, all currency, coins, stamps, etc. had to be replaced, as the current issues were now demonetized. There was not enough time to design and print a new series of postage stamps. 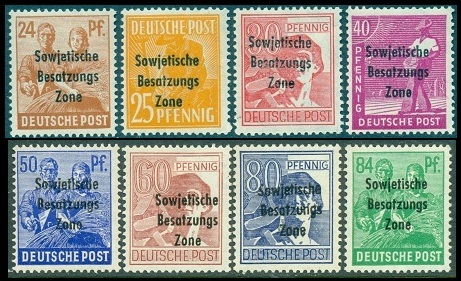 In order to indicate that the old postage stamps were now demonetized, the existing stocks of the Allied Occupation general issues in the Soviet territories were overprinted for emergency use. 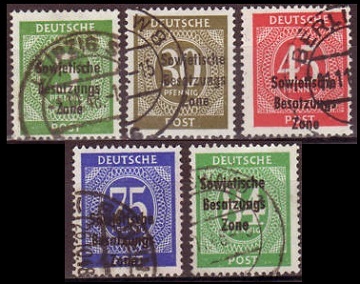 The overprinted stamps have the same attributes as the original issues, as described in the Allied Occupation Stamps - General Issues - 1946 and 1947-1948 sections. 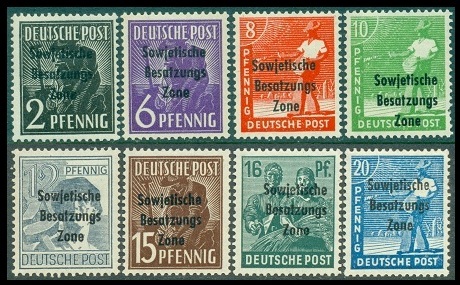 The 1947 pictorial definitive stamps shown in the image above were re-issued on July 3, 1948, and they were overprinted Sowjetische / Besatzungs / Zone, indicating that they were valid for use only within the the Soviet Occupation Zone (Mi. #182-197, Sc. #10N1-16). The two stamps shown in the image above (Mi. #198-99, Sc. #10NB1-2) were issued on August 29, 1948 to publicize 1948 Leipzig Fall Fair. This Fall issue was printed on paper with a multiple flowers watermark. The two designs depict the "First New Years Fair of 1459" and the "Arrival of Cloth Makers from Abroad in 1469". 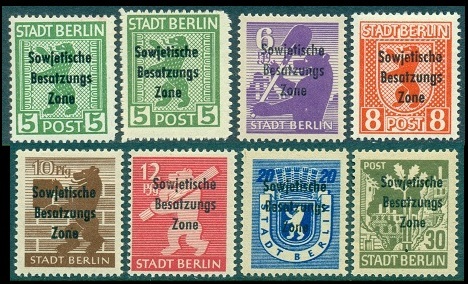 In September 1948, remaining stocks of the Berlin-Brandenburg issue and a few of the 1946 Allied Occupation numeral issues were also overprinted for use in the post-reform Soviet Occupation Zone. Their attributes are, of course, the same as the original printings. The Berlin-Brandenburg 5 Pf. stamp comes in two varieties: Perforated 14 and Rouletted. All of the overprints are shown in the images above (Mi. #200-11, Sc. #10N17-28). Finally, on October 11, 1948, a brand new set of definitive postage stamps was issued for the Soviet zone. They are all shown in the scans above (Mi. 212-227, Sc. #10N29-44). This issue was printed on paper with a multiple flowers watermark. 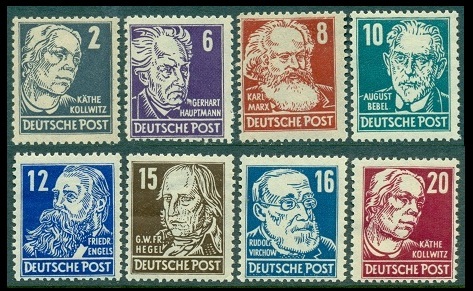 This new definitive set featured eight portrait designs of famous German socialists which are: Kathe Kollwitz (1867-1945), Gebhart Hauptmann (1862-1946), Karl Marx (1818-1883), August Bebel (1840-1913), Friedrich Engels (1820-1895), Georg Hegel (1770-1831), Professor Rudolf Virchow (1821-1902), and Ernst Thallman (1886-1944). The stamp shown above (Mi. #228, Sc. #10NB3) was issued by the Soviet zone on October 23, 1948 to publicize the annual "Stamp Day". The stamp depicts the arms of the Institute for Philately. 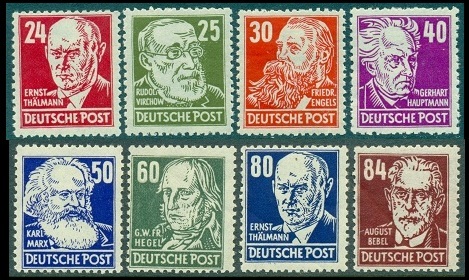 East Germany, along with most of the other countries of Europe, issued such stamps every year to promote "stamp collecting". There is another motive though, in regard to the Eastern Bloc countries. Promoting the collecting of their postage stamps was a superb medium, for spreading propaganda about their Socialist way of life all over the World!